Supporters of Ivory Coast's President Alassane Ouattara and his party, the Rally of the Houphouetists for Democracy and Peace (RHDP), attend a campaign rally at the place inch alla in Abidjan, Oct. 20, 2015. At 3 a.m. on a Sunday last month Charles Kakou was awoken by the trill of whistles he had helped distribute to warn that bulldozers had arrived to demolish his seafront community in Ivory Coast's commercial capital Abidjan. Police moved in with tear gas, arresting anyone who resisted. By the afternoon, Kakou and his neighbours were homeless and the last vestiges of what was once a 9 km-long (6 mile) coastal shantytown had been reduced to rubble. "We've been here for 40 years. All our children were born here," he said, standing amid a vast expanse of sand and broken concrete adjacent to a highway, whose refurbishment authorities used to justify the eviction of tens of thousands of residents. Ivory Coast's President Alassane Ouattara of the Rally of the Houphouetists for Democracy and Peace (RHDP) party waves as he arrives for a campaign rally at the place inch alla in Abidjan, Oct. 20, 2015. In the five years since President Alassane Ouattara was elected, Ivory Coast has emerged from a decade-long political crisis and a 2011 civil war to become Africa's rising star. 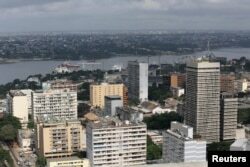 As other economies on the continent have crumbled amid a global commodities crash that has sparked capital flight and tanked currencies, Ivory Coast has posted GDP growth of around 9 percent over the past three years, according to the government. 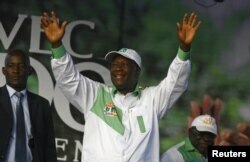 Ouattara is expected to ride the economic boom to a comfortable election victory in a poll on Sunday. An influx of foreign investment is visible in the vast supermarkets and chic hotels sprouting up to cater to businessmen and the well-to-do. But many in the West African nation complain they have been left behind and the president's critics warn that economic exclusion is undermining efforts to close the book on the years of unrest. "There's been an economic aspect to this crisis," said Pascal Affi N'Guessan, Ouattara's main challenger, who argued that economic growth that is not inclusive does little to ensure future peace. "We must create jobs, fight against the high cost of living and poverty," he told Reuters. "It's because the nation is poor by-and-large that so many young people were involved in the destabilization of their own country." Ouattara, a former senior International Monetary Fund official, has sunk billions of dollars into rehabilitating large-scale infrastructure like road and rail links left neglected during a decade of turmoil. FILE - Buildings are seen in the Plateau district in Abidjan, Ivory Coast, Sept. 11, 2015. The president says the approach, often deployed in post-conflict countries, is a necessity if Ivory Coast is to attract investors who will revitalise the private sector, allowing wealth to trickle down. But Joel Atsain, a 31-year-old electrician from Abidjan's working class Yopougon district, is not convinced. "Roads? Can we eat roads?" he asked rhetorically as he watched a group of mechanics throw dice across a Ludo board to kill time. One of the dice players, Patrick Gogoua, 35, said that he and his friends were constantly broke and that business was better before Ouattara's election. "Sometimes we split a cigarette between three of us," he said. "We're tradesmen. But there's no improvement in the work. We have to wait for customers, but then when they come they give 1,000 or 2,000 francs. I have two kids at home." Ouattara rejects criticism that he has not done enough to battle unemployment and improve the standard of living for average Ivorians. He claims two million jobs have been created on his watch and agriculture sector incomes have increased 20 percent. Per capita GDP is also climbing. 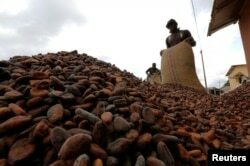 The price per kg earned by Ivory Coast's roughly 800,000 cocoa farmers has increased by nearly 40 percent since the government introduced sweeping reforms of the sector in 2012. Ouattara's administration also recently created a new youth employment office that has financial support from the World Bank. "Once you get more jobs in the cities and with the youth, then you have a faster perception that everyone is sharing equitably," he told Reuters in an interview this week. "We have the policies now, we have the programs, we have the financing. It's the implementation we really have to concentrate on." If he wins re-election this weekend, as expected, Ouattara will have to move quickly. While a June opinion poll by the Washington-based International Republican Institute found that two-thirds of Ivorians thought the country was heading in the right direction, just 31 percent believed the economy improved in the past year. Highlighting people's expectations, nearly two-thirds expect their personal economic situation to improve in the coming year, the survey said. Charles Kakou, like most from the demolished beachside slum, sleeps in the cramped home of a friend on the other side of the immaculate new highway. He said all of his former neighbours backed Ivory Coast's economic development but said few were likely to turn up to cast their ballots on Sunday. "How can we be motivated to vote if we don't even have a roof?" he said. "They're out on the street. How do you want them to go vote?"